I won't lie to you. Making these things is not for everyone. The ingredients—the whole recipe—is simple enough. Nothing to it, really. 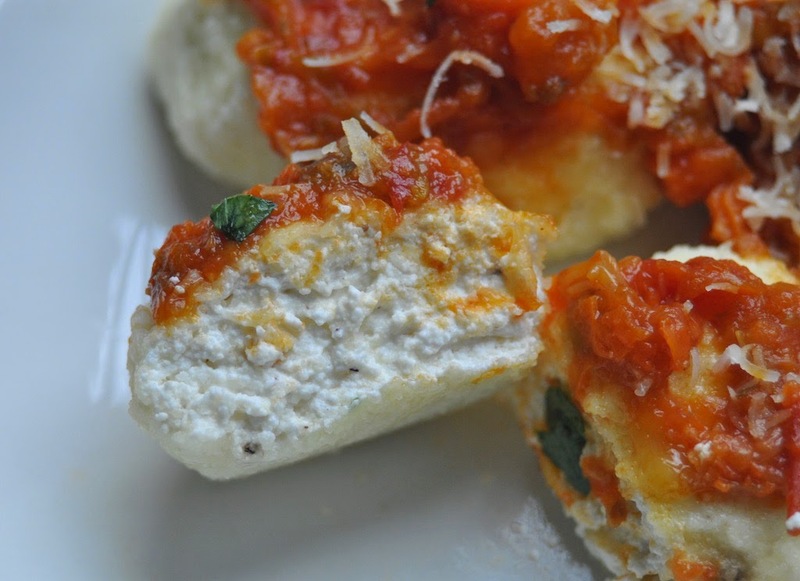 But few things are lighter and more delicate than well-made gnudi. And so it all boils down to patience. You'll need a lot of it. And a very light touch wouldn't hurt. I wanted to make the gnudi a lot like my cheese gnocchi, meaning that there'd be very little else in them but the ricotta. That means making certain to drain as much moisture from the cheese as possible; since I was a little short on time I lined a colander with paper towels and swapped them out three or four times over a couple hours. 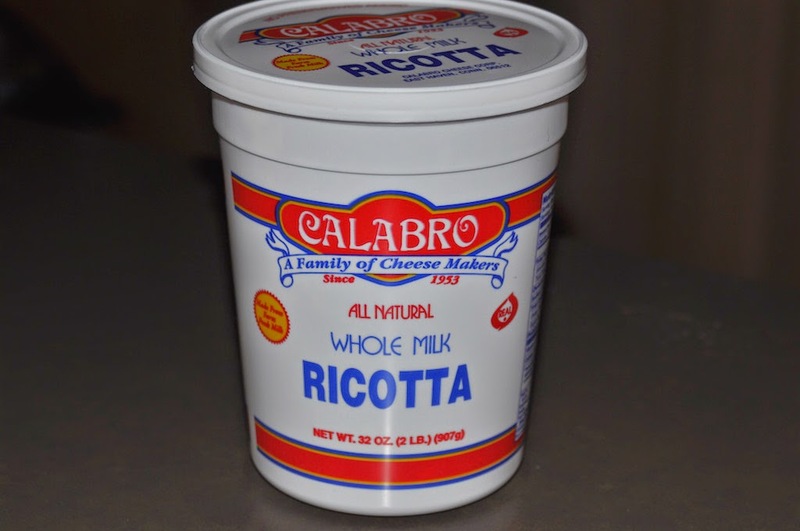 In a bowl place the two pounds of ricotta, 1/4 cup of freshly grated Parmigiano-Reggiano, some freshly grated nutmeg, salt, pepper, and 1/4 cup of semolina. Taste to make sure the seasoning is right, and adjust if necessary. A couple important things about the semolina: First of all, it should neither be super fine nor very course. Go with a medium grain semolina. You might also consider upping the amount. 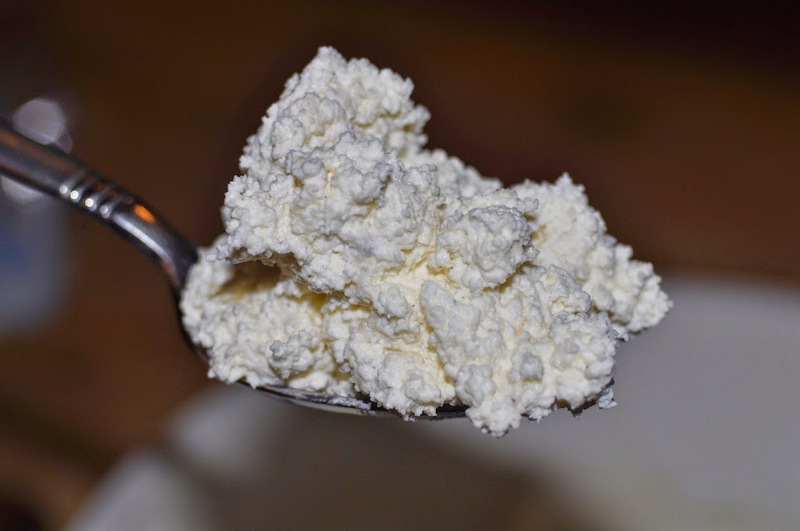 Most recipes call for a lot more semolina than I've used here, and for good reason: It will make the gnudi much easier to work with—and a lot less likely to fall apart. My way is more risky, and it absolutely requires great patience and care, particularly when cooking and saucing. Don't get me wrong, this recipe works just fine—for me. But it does make me a little nuts because it is so very delicate. 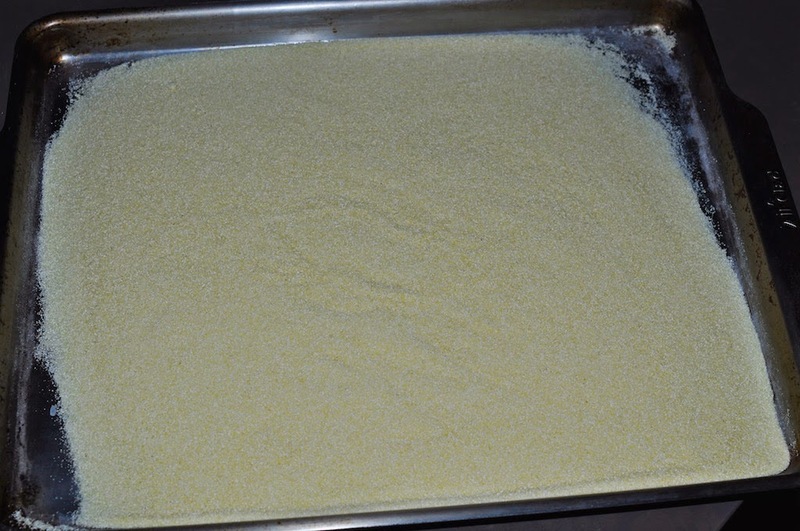 Cover a baking sheet with a thick layer of the same semolina used in the cheese mixture. 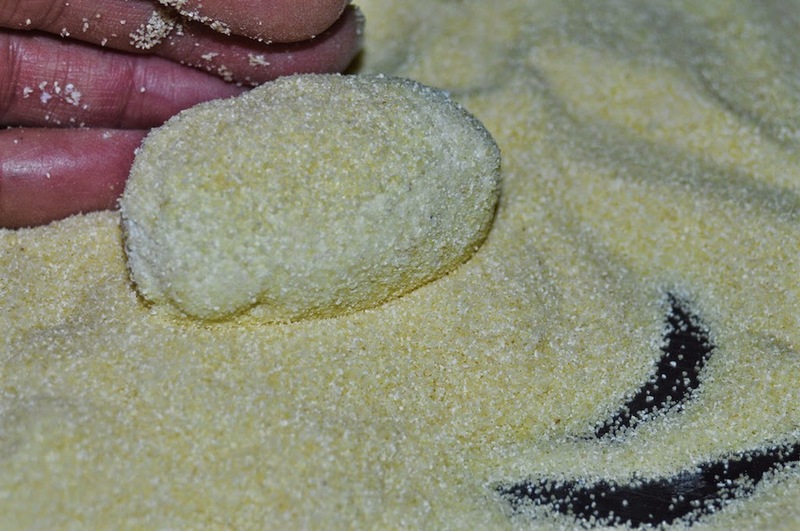 Roll the gnudi in the semolina so that the flour completely covers it. Once you've finished rolling all of them place the tray (uncovered) in the fridge for a while. Which bring us to another important point. 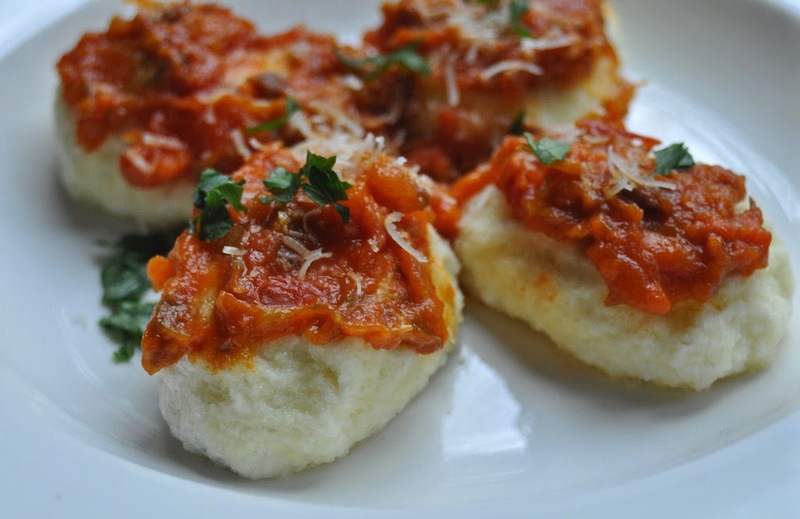 I formed my gnudi at 6 am and didn't serve them until 8 pm, so they sat in the fridge for more than 12 hours. 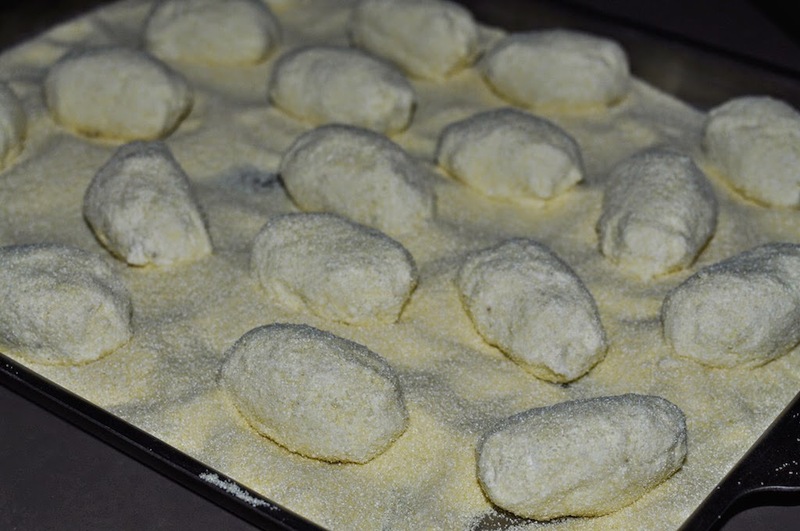 During that time I turned and covered the gnudi with more flour at least twice. 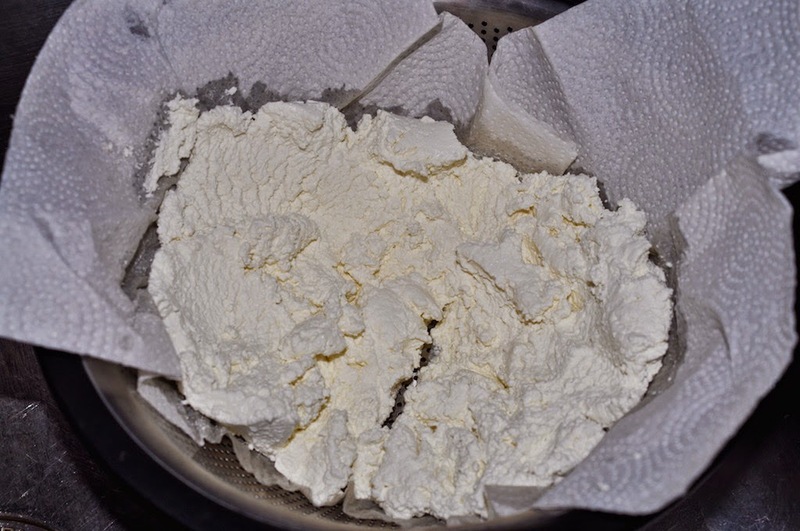 What's happening here is that the flour is slowly hardening and the cheese is drying a bit. (I've seen recipes where you leave the gnudi in the fridge for three days.) 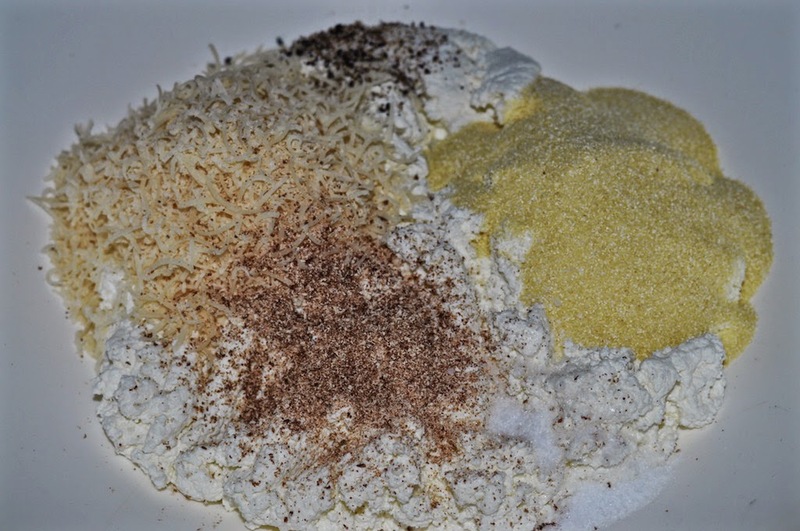 If you decide to go the safer route and use a good bit more semolina in the cheese mixture then this stage isn't all that important, if at all. Most recipes skip this stage entirely, in fact, because most use a lot more flour than I do. Again, it's a personal choice. As for cooking the gnudi, again, patience. Drop them into a pot of well-salted water—quickly but one at a time! These took four minutes to cook (it's always best to test just one and see how long it takes before committing to an entire batch). Only remove them from the water with a slotted spoon, then place them directly into individual plates and apply sauce (roasted tomato & prosciutto here). 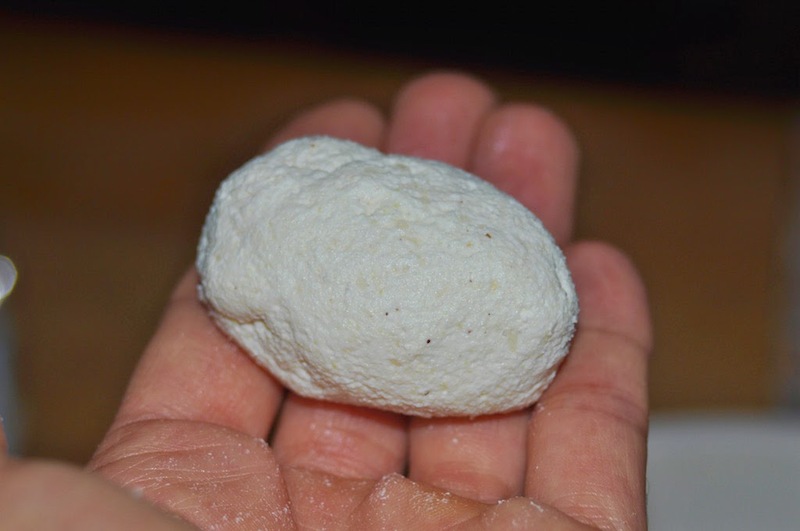 At this size the gnudi boiled for four minutes. And they were totally worth all the effort. I’m not a wine expert. Nobody has ever paid me to write about the stuff, not once, and I have been in this word game a long time. My friend Tom, who makes a living writing about adult beverages, complains about the lack of wine coverage on this blog, specifically Italian wines, which I'll admit to spending many years studying. Okay Tommy, here’s some expert Italian wine advice for you. Read it carefully, because this might just be the only time I give advice like this in public. Never pay $50 for a bottle of Italian wine when you can get it someplace else for $8 and change. Come to think of it, this probably goes for all wines, not just the Italian ones. But, as I said before, I'm no expert. I can rant all day about this but will simply lay out the facts and be on my way. My Associate and I were in Arizona recently, on a driving trip that spanned a little south of Tucson to a little north of Flagstaff. On two occasions we dined at places whose wine lists had been Wine Spectator-approved. They could not have been more different. The first was the dining room at Hacienda del Sol in Tucson. The wine list, a book that required true commitment to plow through, included the requisite I-don't-care-what-it-costs-just-bring-me-the-damn-bottle selections (the $4,500 Vosne-Romanée comes to mind). But it was in no way a list crafted to rip you off. I found a really nice Nebbiolo d'Alba for $54—and it was 15 years old! 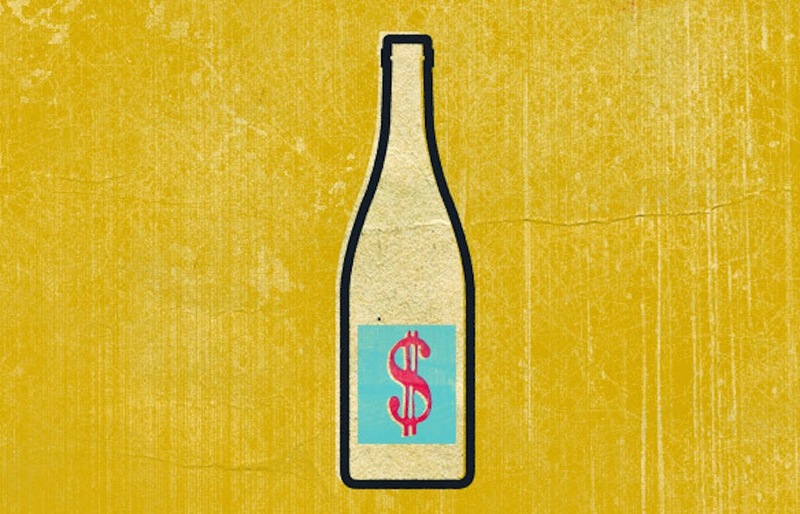 The same bottle in a wine shop (if you could even find it) would cost at least $30, maybe more. Another bottle we cracked open was a 2008 Sagrantino di Montefalco, a little-known Umbrian varietal that I like a whole lot. The retail price on this particular bottle is around $25. It's on the wine list for $59. I'd call that very reasonable, especially given that the restaurant is in a resort. Days later, at L’Auberge Restaurant on Oak Creek in Sedona, also the kind of place that prefers entire wine books over lists, I found the exact (if misspelled) vintage of Sagrantino di Montefalco, but for $75, not $59. This didn't bother me so much. Okay, it bothered me a little. But what really got me going was this place's entry-level Italian wine. This is the least expensive bottle on L'Auberge's paltry selection of Italian wines. 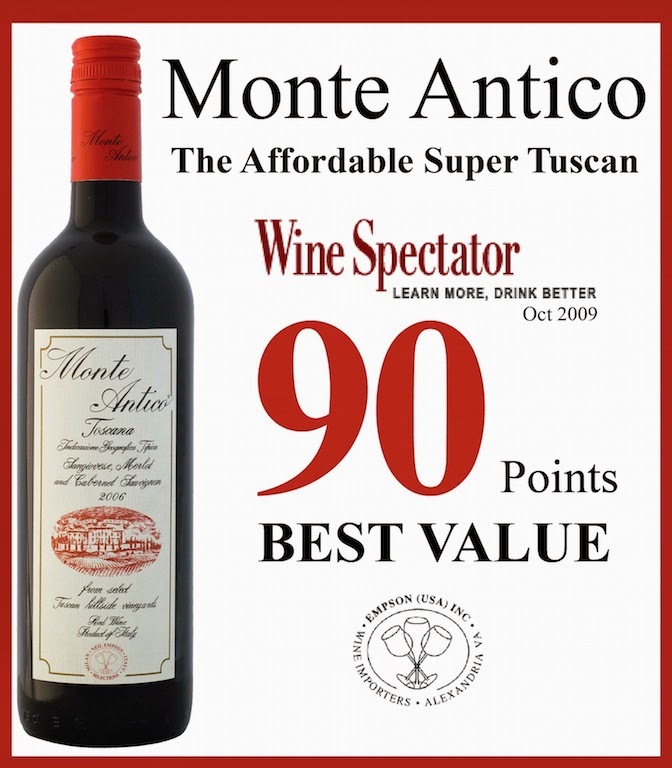 It's the 2009 Monte Antico, a Tuscan blend of Sangiovese, Merlot and Cabernet Sauvignon. The price: $50. Average retail price: around $10-12. Though I've seen it plenty of times (at the supermarket, for instance, as this is one very high-production label) for less than $9. This is a place where the least expensive dinner option is a three-course prix fixe job at $80. Serving Monte freaking Antico. Seriously. I don't begrudge a restaurant from getting its markup, even a hefty one. But if you're going to pull a scam at least be smart about it and pick a $9 wine that I never heard of—and that I can't pick up where I buy milk and laundry detergent.